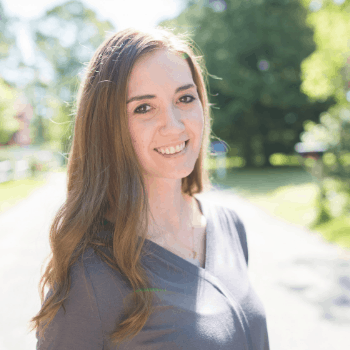 Looking for a fun event for the entire family? 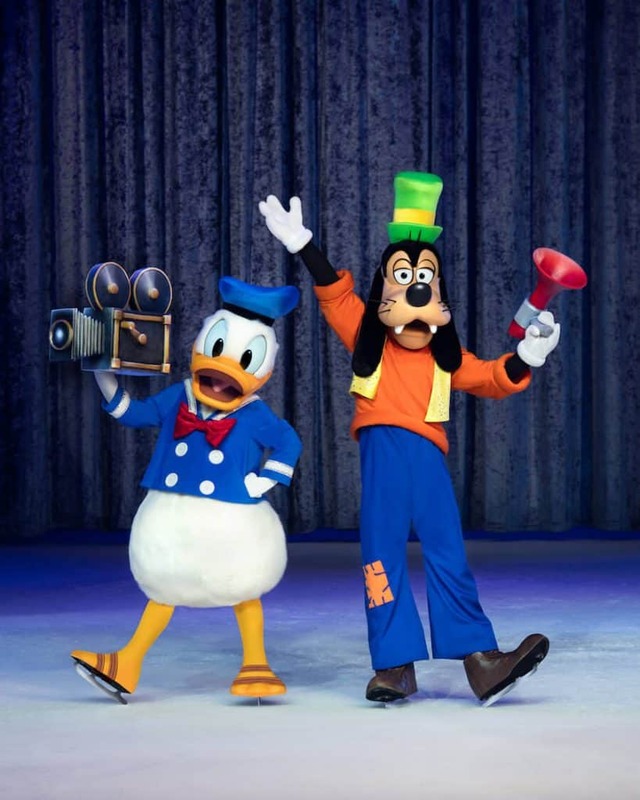 Disney on Ice is the perfect way to spread a little magic to your day. 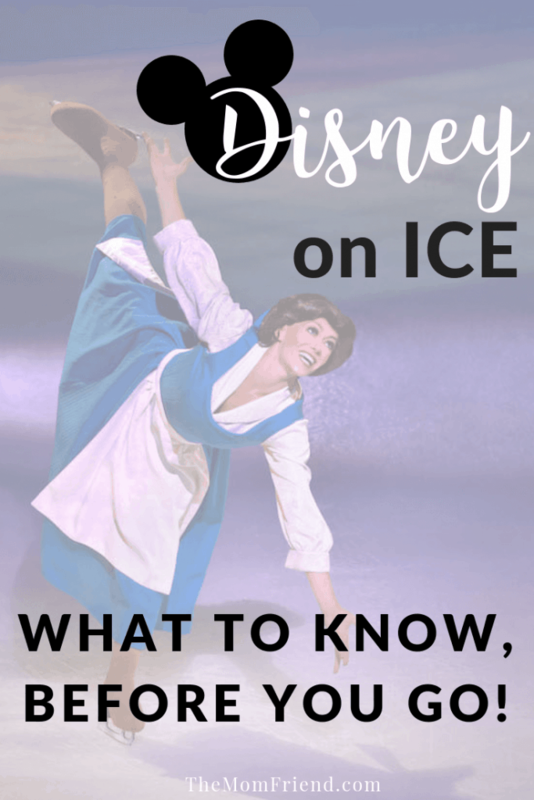 If you are thinking about taking your family to a show, read on for my Disney on Ice 100 Years of Magic review, plus some tips to keep in mind before attending! It is no secret that we LOVE Disney here at The Mom Friend, and Charlie is 100% obsessed with her new “best pal Mickey” after meeting him in person at Aulani during our trip to Hawaii. 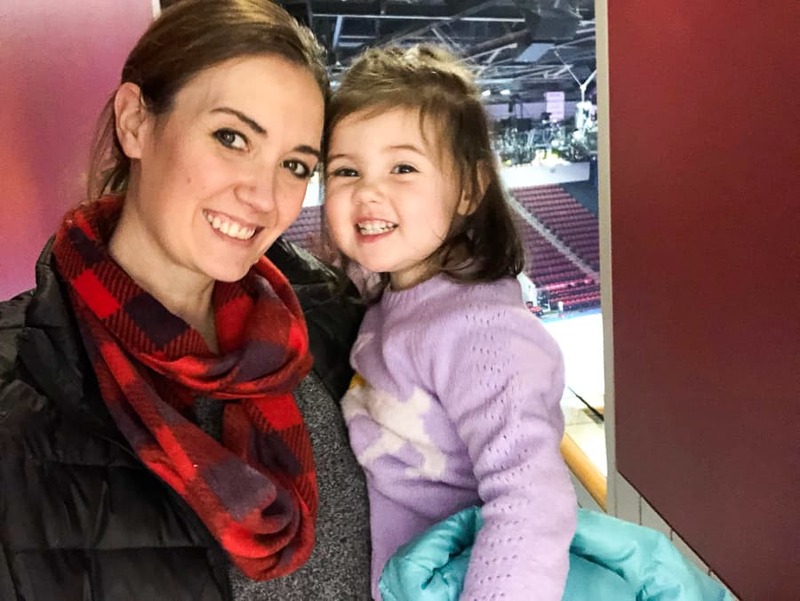 I was so happy to be able to take her—along with my parents—to check out Disney on Ice’s 100 Years of Magic Show at Agganis Arena in Boston over Christmas vacation. Thank you Disney on Ice for hosting us! Every time we see a commercial on Disney Junior for Aulani, or one of the Disney parks, Charlie waves hello to all of her favorite friends and says “see you soon!” It is too cute for words really and I just could not wait to give her a little Disney fix before we make it down to Disney World or back to Disneyland again. As a bonus, she is also fascinated by ice skating and is learning how to skate after getting a pair for Christmas (which she calls roller skates on ice). So Disney friends + ice skating? Perfect combination! 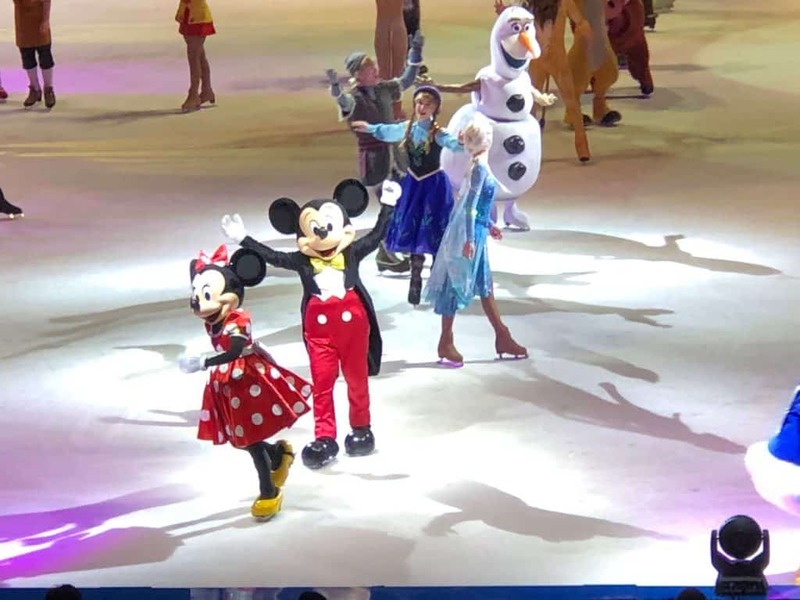 I had actually never been to a Disney on Ice performance before, so really had no idea what to expect (apart from knowing it would be fabulous since it is from Disney). The show truly was magical—in fact, it was the only thing that could stop full swing toddler tantrums! We went the day after Christmas, and Charlie was utterly exhausted from multiple days of no naps, late night parties and Christmas excitement. She had such a hard time in the hours leading up to the show but was excited to go see “Mickey Ice Skate”. Once the house lights dimmed and the ice lit up, her eyes grew wide and she sat mesmerized for the entire show. It was such a blast watching her watch the cast and listen to her sing and narrate the show with her cute commentary. The show starts out with Mickey and his friends looking for story inspiration, and transitions to so many Disney favorites—Pinnocchio, Finding Dory, and Beauty and the Beast to name a few—as audience members are swept up in the song and dance of Disney favorites. I loved that it had some of my favorites from growing up too! Everyone in the arena sang along (especially when Let It Go was playing) and it was truly mesmerizing for fans of all ages! Charlie never took her eyes off of the show and even Ellie at 5 months old was clearly taken in by the lights and colors. 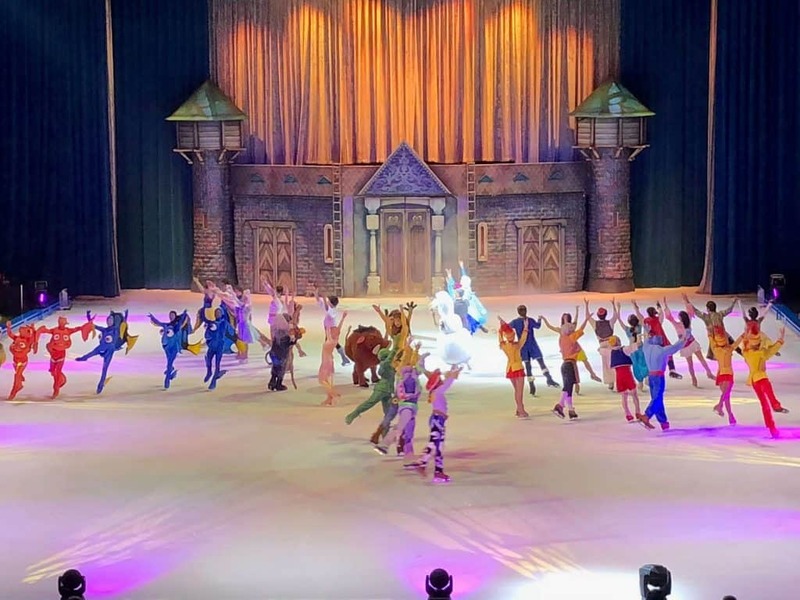 The show includes short scenes or songs from lots of different movies, including Aladdin, Toy Story, a beautifully choreographed fight scene in Mulan and a great musical compilation of all the different Disney Princesses. 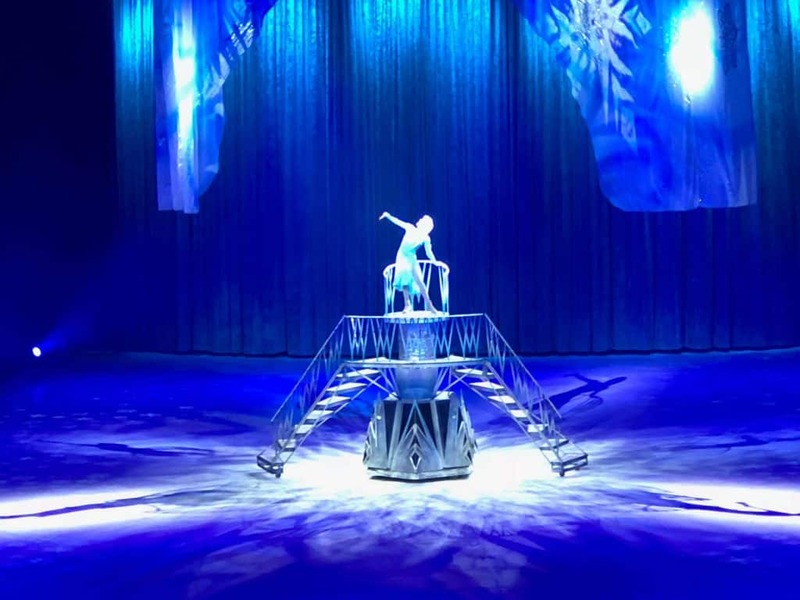 There is a really long segment from Frozen, which seems to be taken from Disney on Ice presents Frozen and gives a good glimpse into what that show would be like—completely awesome! Olaf was especially adorable and I loved watching the comedic chemistry and interaction between the cast members playing Anna and Kristoff. It was so neat to be able to see the characters come to life through the skaters, and I couldn’t help but wonder how some of the characters managed to complete their intricate moves in complex costumes—I doubt I would even be able to stand up and glide in something like what the Beast was wearing! On the opposite end of the spectrum the costumes for Simba and Nala from The Lion King are very form-fitting, but after a few trips around the ice, it became clear as to why—their piece was extremely technical in nature and consisted of many stunning lifts and throws. 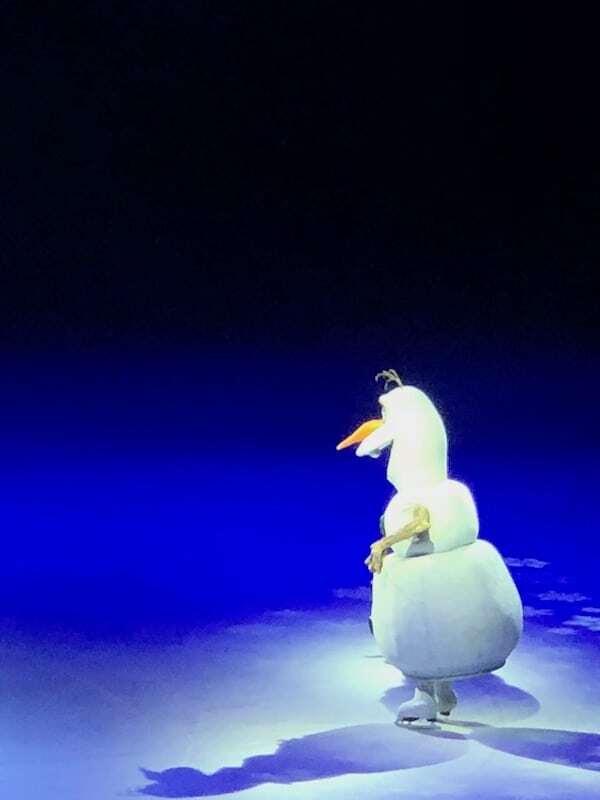 The show runs about 2 hours long including an intermission after the Frozen segment ends. 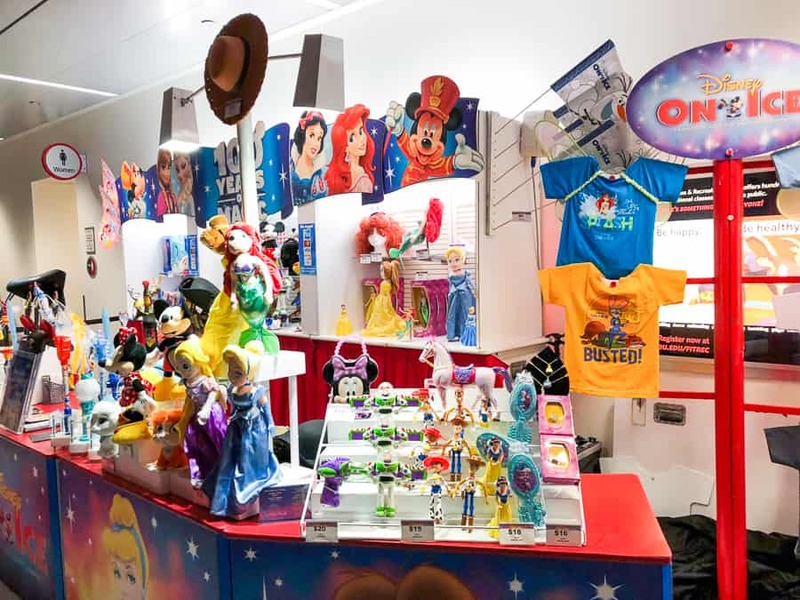 Give yourself extra time getting to the show as kids are going to be walking to their seats very slowly—there is so much to look at! 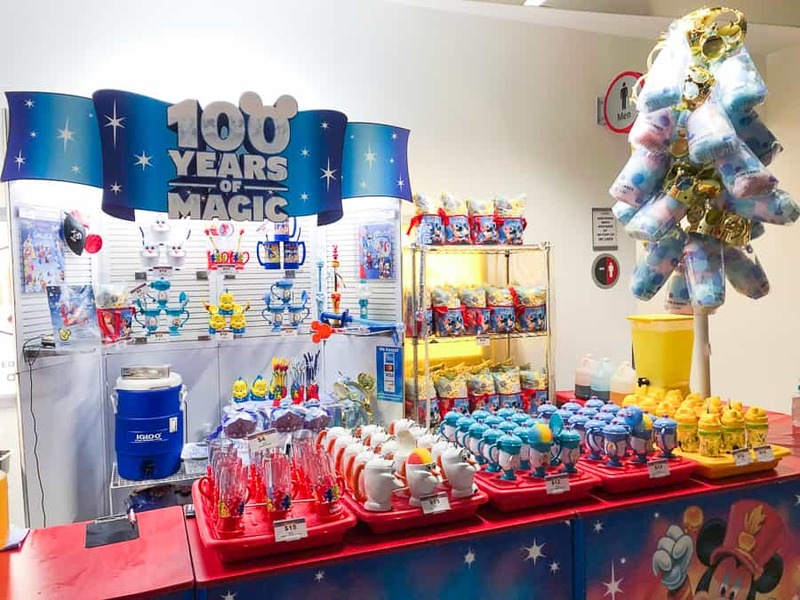 You’ll definitely want to take a few minutes to check out all of the merchandise for sale and the fun snacks—the snowcones are a huge hit and the popcorn was a great item to share. Both came in containers that could be taken home and enjoyed again, which is something I appreciated as it gave extra value! We bought Charlie a snowcone (she insisted on it being in the Olaf mug) as well as a popcorn bag and a souvenir soda. Expect to pay stadium pricing for food items, but in all honesty, they were worth it. The snowcone literally lasted the entire show—with us finishing it in the parking lot—which is likely due to her 3-year-old eating pace and refusal to share with anyone! But we were all impressed that the mug itself kept the snowcone frozen (pun intended) the entire time. It did get messy, however, so a trick we did was to eat the popcorn out of the plastic bag it came in and place the snowcone mug in the souvenir bag to catch the falling ice and keep everyone dry. Worked like a charm! Expect to stand in long lines for the bathroom right before the show starts, during intermission, and immediately after the show ends. There is really no way around that if you don’t want to go during the show—lots of little kids means lots of potty breaks! The lines moved quickly, however. The show is fun for all ages—littlest ones included! Though she slept for most of the show, when she was awake Ensley loved looking around and taking everything in. She was even sick the day we went and didn’t seem to let that bother her. Babywear using a compact carrier or ring sling. Depending on your venue, a stroller may be an option but is likely not something you will be allowed to take inside or to your seat. I wore Ensley in a ring sling which left me hands-free for walking with Charlie and gave me a little more security climbing down the arena stairs. I didn’t wear her during the show, but you totally could if you wanted! Bring a diaper changing clutch inside your diaper bag, and don’t wait in line at the bathroom. Everyone waiting is for a stall. Just politely ask to scoot by and let people know you are just using the changing table. A diaper clutch makes it easy to have everything you need without having to bring an entire diaper bag along. If you are worried about noise sensitivity, pick up a pair of noise-canceling earmuffs like these designed to protect babies’ ears. Be sure to bring warm apparel to keep your baby warm. Ice-related events tend to be on the colder side for audience members. We were comfortable in sweaters, but Ensley felt a little cool, so spent most of the show with her hat and gloves on as well. If you can, try to go to the earlier show. 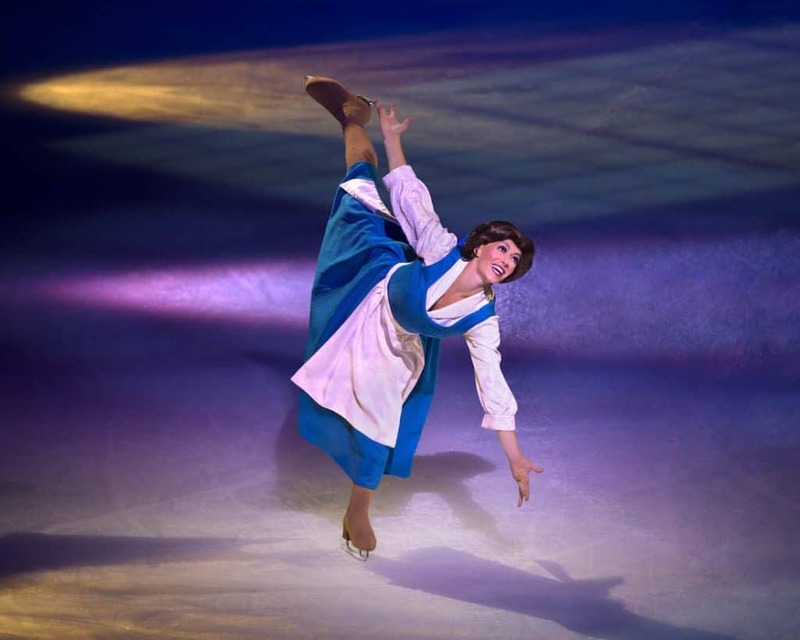 Many of the Disney on Ice shows have a morning or matinee show, and one around 7pm. We did the matinee, and it was perfect. I think the 7pm would have been too late for both girls! 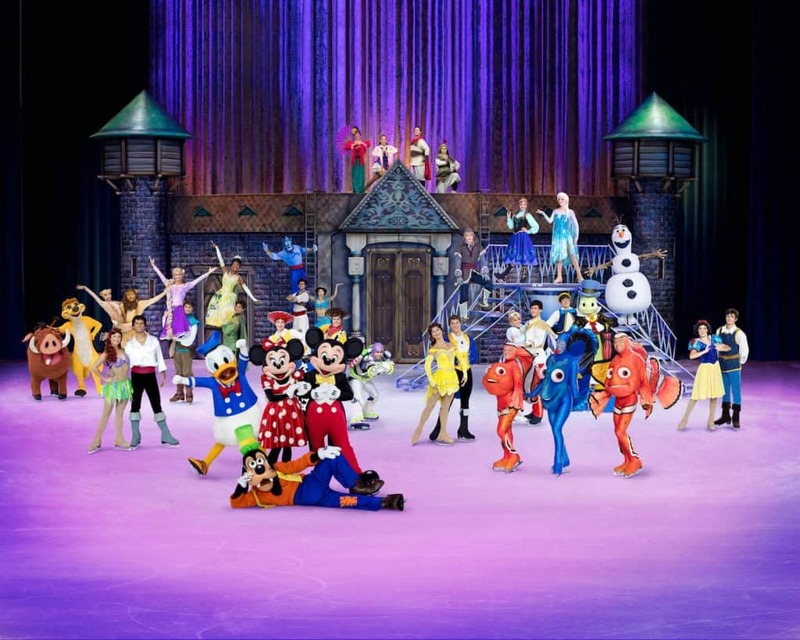 The great thing about Disney on Ice is there are so many different shows that it is easy to find one at a venue near you. 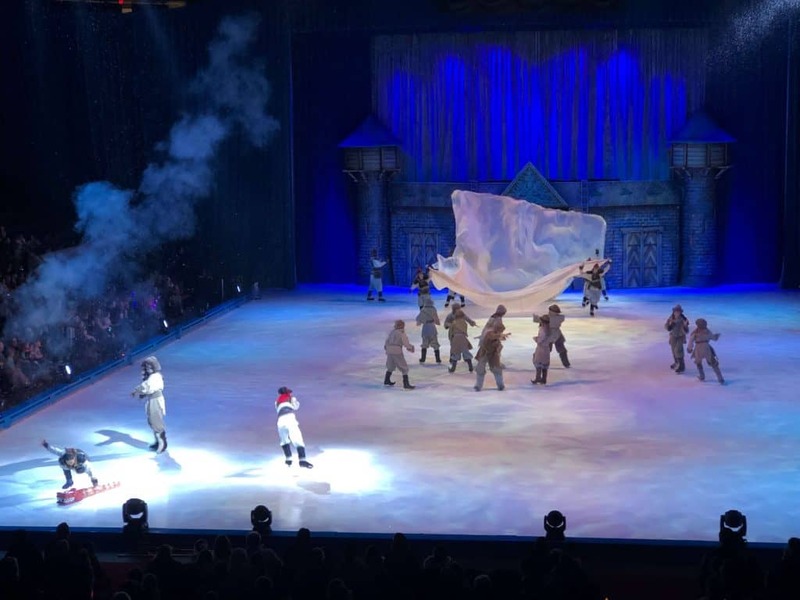 You can find more information on Disney On Ice Celebrates 100 Years of Magic, including show times and ticket prices here. 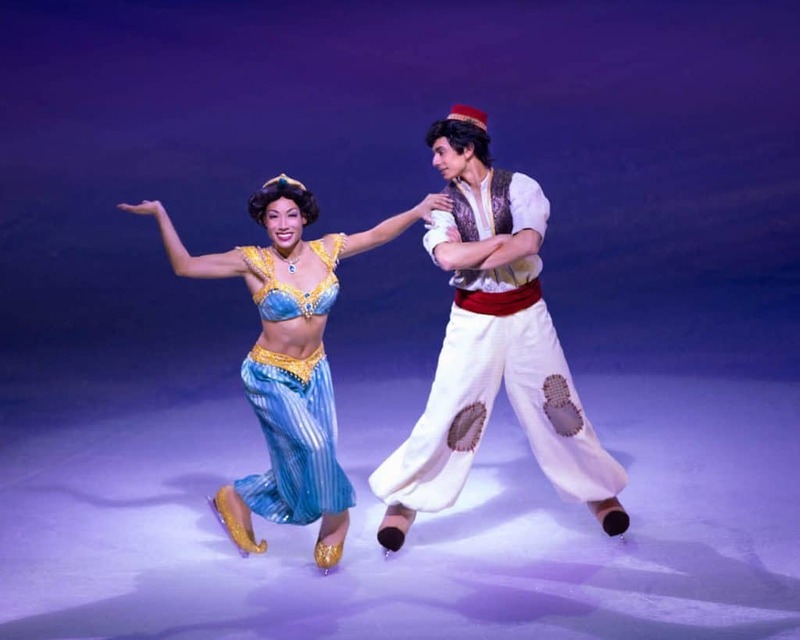 For other current shows, check out the Disney On Ice website with full details on all 5 shows! I definitely recommend taking the family to see 100 years of Magic—or any other show—as it is amazing for both kids and adults alike!